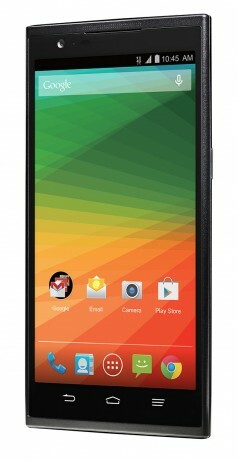 ZTE today announced the ZMax, a large-screen phone exclusive to T-Mobile in the U.S. The ZMax has a 5.7-inch HD screen, Corning Gorilla Glass 3, 8-megapixel camera with flash, 1.6-megapixel front camera, large 3400 mAh battery, and runs Android 4.4. It also sports a Qualcomm Snapdragon quad-core processor, 16 GB of internal memory, and a memory card slot. Unlike many previous ZTE phones, the ZMax is fully ZTE-branded. It will go on sale September 24 for $252 (full retail), or $10.50/month on a payment plan. AT&T is preparing to launch a ZTE smartphone called the ZMax 3, say documents found on the FCC web site. The ZMax 3 appears to be a variant of the Grand X 3, which AT&T-owned Cricket Wireless has sold since earlier this year.